Sadly, we had to put my beloved Mac down last Monday. He had become increasingly aggressive and was becoming a real danger, especially to myself and to Bailey. This was not something we took lightly and tried everything we could to avoid this outcome. We consulted with several veterinarians, read books, made changes in our care along with adding pain and anxiety medications. It was likely that he suffered from a touch dog dementia in addition to arthritis in his hips. These measures did buy us extra and precious time with him, which I greatly treasure. Having to put him down was the most difficult thing I have ever had to deal with in my life. I am missing my baby boy terribly and don't know how I am going to handle going to the lake without him. He's been at the lake as long as we have. Bailey is such a comfort and I thank God that my friends encouraged me to overlap dogs. I know in my heart that we made the right decision. He almost killed Bailey last weekend. I could have never forgiven myself if that had happened. 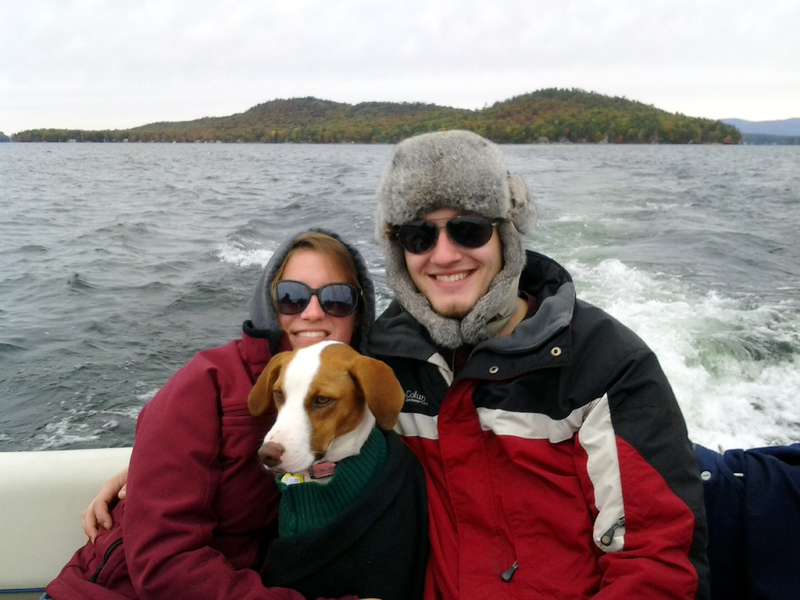 A true Lake Winnipesaukee dog, Mac loved water sports of any kind, hiking, boating and loafing in the sun. He loved biting at waves. He guarded us against ducks, airplanes and thunder. The rock to the left of the splash and mostly out of the shot was named Mac's Rock when we arrived on the island. One of his most favorite haunts. Goodbye my sweet boy. I will miss you until the day I die. You were the best and smartest dog that we have ever had and I thank you for being my friend. Your sense of humor was incredible, always finding ways of making mummy laugh. You trained our Bailey girl well and you live on in her with mannerisms that she learned from you. No doubt she will pass along some of these traits to a future pup. I love you forever MacKinnon. 11 1/2 years was just not enough. I had planned on at least 15. Last edited by Rattlesnake Gal; 03-06-2012 at 02:26 PM. I'm sorry to hear that RG. You did the right thing, even though that thing was very very difficult. As pet owners that make our quadraped pals part of the family those decisions are never easy, but in the end Mac is in a better place now. I am in the same situation with my Bella, hip dysplatia and doggie demensia, and we are trying to evaluate her quality of life. I cannot image our house without her and can only imagine your pain. This was a lovely tribute. Take care of yourself. I am so sorry, RG. He was quite a character! They are just the loves of our lives, aren't they? But you all have to stop posting these sad stories, I am tired of crying!! I can't resist looking but don't want to at the same time. Fortunately mine are 6 and 2 now so hopefully we won't have to go through it again for a long time. That said, as an avid pet lover myself (3 cats...one quickly passing through the latter stages of her life) your tribute brought a tear to my eyes, especially knowing I have a tough decision ahead of me not too far in the future. No pet could have ever enjoyed more the love and companionship you & your family obviously gave MacKinnon. The pride you must share with your family in that comforting thought should help ease the pain, even a tiny amount. I am so sorry to hear about Mac. I can only imagine how upsetting it must be for you, as I know how much you loved him. we are so sympathetic to you and your family for your loss for your beloved Mac. Try to remember all the good times that you had with him, and he gave back to you. He will be with you at the lake in your heart and your memories, and you will smile at those happy memories, trust us, we know. With 2 dogs who are as much a part of our family and lake life as yours, my heart aches for you. Over time, it will be the good times that you will remember, and they will make you smile all the more. MacKinnon was moe than a dog, he was an intergral part of your life, your best buddy. He really loved you. You did the best by him and he knew that. I have my memory of watching Mac out on Rattlesnake especially the day he came running out onto the dock and jumped in my boat, before we had docked, to greet you. You have given him such a wonderful tribute here. RIP MacKinnon. What a wonderful tribute! You were all lucky to have found one another. Sorry to hear of your loss. We had a toy poddle that we had to put down at age 16, so we know what you are going through. You sure have had your share of grief the last few months. It's so hard to bury a pet. Try to remember the wonderful times you had together. I'll be thinking of you and yours in my thoughts and prayers. Very sorry to read about your hard, but truelly humane decision. Celia: your eloquent and love-filled tribute to Mac on this site has me sitting at my desk with tears flowing down my cheeks. I know you and Paul adored Mac, he was a smart, loving little guy. I am sorry to hear that you all underwent such a terrible experience between Mac and Bailey. Something so similar happened to Jerry and me right before we permanently moved to NH, and we found ourselves facing the same decision. I wish there were words I could offer you and Paul that would provide comfort, but I think that only comes with the passage of time and the ability to remember only the good parts. I am glad Bailey survived and hope she can help you all to heal. So sorry to hear about your loss. My thoughts are with you, Paul, Bailey and the kids. I can see what a joy McKinnon brought to your life. I am sure he will be greatly missed by many that knew him. I am so sorry for your loss. Your kind words, thoughts and prayers really do help. Thank you. Mac was an amazing boy and it was so unfortunate how the end of his life played out. In one respect, knowing that the time was getting near to make this difficult decision allowed me to savor every extra minute that we were able to give him. He was such a joy and I feel blessed to have had such a fine dog. He is going to be missed for a very long time. We can tell that Bailey has been missing our boy too. She has been a bit more apprehensive without the guidance of Mac, but each day she seems to be getting better. We are working on perfecting her recall and want to do some more socializing. She adores it when our son's dog comes to visit. They love to romp around and wrestle, which is something that Mac wasn't willing to do. Once we gain her a little more experience, I think we will get her a Cairn Terrier puppy, so she can have this kind of fun on a full time basis. Then Bailey can teach her sibling all the things that MacKinnon taught her. Overlapping dogs is a beautiful thing... I highly recommend it. Thanks again for the kind words. I really appreciate the support. You guys are the best. My condolences on the loss of your beloved pet. It is always hard to deal with the loss of ones pet, but luckily you still have some company to ease the pain. I am so sorry to hear about Mac. The loss is horrible, yet we move on eventually and add another wonderful pet to our lives. We must be nuts to keep doing this to ourselves! Our island pets have very rich lives and are lucky to be at the lake where they have more freedom. I am sure Bailey will teach a new friend to find the same joy that Mac had. He paved the way for the rest to follow! Celia: we have had a Labradoodle (Cosmo) for about 6 months. He was initially very timid, and not socialized very well. We started taking him to Wolfeboro, to O'Brien's Pet Supply on Bay Road, owned by Jim O'Brien who is the K9 officer in Wolfeboro. On Saturday mornings from 10-11:30, he has a dog socialization period - it costs $5 - and Jim is always there, and works with the different dogs. We have also taken Cosmo to 2 obedience classes with Jim, and next will be the Canine Good Citizen - which I never thought would be possible. It has helped tremendously. I know that going to Wolfeboro on a Saturday AM is not ideal for you, even in the summer, but I cannot praise Jim enough. Maybe there is something down near you that you can find for Bailey. If not, come good weather, boat on over to WB-we can even pick you up at the dock, if you'd like. Wow, what a strange moment I just had. Right before I opened this thread a photo I have of my deceased cat fell on the keyboard. I put it back up and was thinking about when I had to say goodbye to her. Then I opened this to read your wonderful tribute. Well done. As you put it Celia, putting her down a few years ago was the hardest thing I have ever done. Happy thoughts between the tears from now on. Sorry to hear of the loss of your "Mac." Thanks again everyone for the condolences. Sharing the sad news about Mac, posting a tribute and all of your responses has really helped me to heal. Thank you. Great idea Donna! I will be bringing her for a few hours of play on Monday morning, with our first training class on Monday evening. Bailey just had a nice visit from her girlfriend and my granddog, Fiona. Bail seemed sad after Fi left... can't wait for her manners to be polished, so that we can get her another live in playmate. So very sorry for your loss and the decision you had to make, but I'm sure the wonderful memories you have shared with us will soon outweigh the pain of Mac's decline. I only knew him from a distance but he and Bailey were a part of the community on the island, hopefully Bailey can come play with our Darcy sometime this summer. I know she was curious last summer. Well, we finally had to say goodbye to Bella this Sunday and my heart is broken. I know time helps heal all wounds and I hope you are healing quickly with your loss. winnisummergal, I am so very sorry to hear about your losing your sweet little Bella. Our pets sure have a way of nestling into our hearts and it is gut wrenching when we have to say goodbye. You are not alone in your grief. Keep those memories close and wrap yourself up in them. In time, I hope that you will be able to find another friend to love. When that happens, please know that you are not being disloyal to Bella. No dog could ever take her place. I still miss our first Cairn Terrier, Sam, that we had for five years and lost back in 2000. He had an endearing habit of ear sniffing. I think it was because he was too short to sniff butts. As you might expect, I am missing my boy Mac like you would believe. I have been having many good days with a few bad times sprinkled in. Tomorrow is going to be very bittersweet as we have never made a trip to the lake without him. Bailey is such a comfort and I know she and Paul will help to get me through. Take heart, we will see our furry friends again one day. They will be there at the door to greet us when we ourselves are called home. Until then, they are angel dogs. Many thanks go out to Bear Island South for sending me such a comforting book! winnisummergal, look for my PM, I would very much like pay it forward and send a copy to you. I am very sorry too, winni. It is such a sad thing to have to go through.